A struggling novelist travels the world to avoid an awkward wedding in this hilarious Pulitzer Prize-winning novel full of "arresting lyricism and beauty" ( New York Times Book Review). WINNER OF THE PULITZER PRIZE National Bestseller A New York Times Notable Book of 2017 A Washington Post Top Ten Book of 2017 A San Francisco Chronicle Top Ten Book of 2017 Longlisted for the Andrew Carnegie Medal for Excellence, the Lambda Award and the California Book Award "I could not love LESS more." 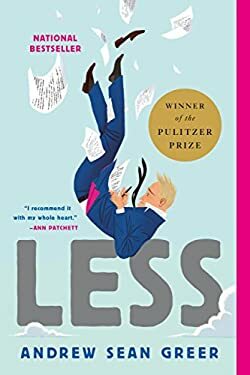 --Ron Charles, Washington Post "Andrew Sean Greer's Less is excellent company. It's no less than bedazzling, bewitching and be-wonderful. "- - Christopher Buckley , New York Times Book Review Who says you can't run away from your problems? You are a failed novelist about to turn fifty. A wedding invitation arrives in the mail: your boyfriend of the past nine years is engaged to someone else. You can't say yes--it would be too awkward--and you can't say no--it would look like defeat. On your desk are a series of invitations to half-baked literary events around the world. QUESTION How do you arrange to skip town? ANSWER You accept them all. What would possibly go wrong? Arthur Less will almost fall in love in Paris, almost fall to his death in Berlin, barely escape to a Moroccan ski chalet from a Saharan sandstorm, accidentally book himself as the (only) writer-in-residence at a Christian Retreat Center in Southern India, and encounter, on a desert island in the Arabian Sea, the last person on Earth he wants to face. Somewhere in there: he will turn fifty. Through it all, there is his first love. And there is his last. Because, despite all these mishaps, missteps, misunderstandings and mistakes, Less is, above all, a love story. A scintillating satire of the American abroad, a rumination on time and the human heart, a bittersweet romance of chances lost, by an author The New York Times has hailed as "inspired, lyrical," "elegiac," "ingenious," as well as "too sappy by half," Less shows a writer at the peak of his talents raising the curtain on our shared human comedy. New (3039 available) BRAND NEW. Over 1.5 million happy customers. 100% money-back guarantee. Make your purchase count: support Better World Books' worldwide literacy partners.